There are lots of real-time frameworks which exist to allow us to build real-time features and functionality into our apps. However, I often see developers who are excited about discovering real-time framework X and then proclaim "now to find a use for it". Every single application has real-time data and every single application could benefit from real-time features driven by that data. So I felt compelled to write a series of posts covering some of the fundamentals of real-time. 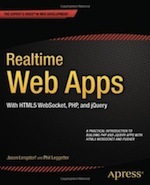 This is complimentary with the series I previously wrote on choosing your real-time web app tech stack. If anything, this new series should be read first. I'm really pleased by this series of posts. I believe they cover some of the fundamentals that have been missing up until now. Every application does have real-time data and with that data you can then build features such as real-time notifications, activity streams, data visualisations, dashboards, interactive communication features such as chat, multi-user collaboration or even expose the data via a real-time API. I'd love to hear your feedback on this real-time fundamentals series. So don't hesitate to get in touch.